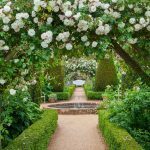 I have recently returned from a week in Morocco looking at gardens. We saw a number of dry gardens around Taroudant which had been designed by the French duo Eric Ossart and Arnaud Maurieres who experiment with different cacti, euphorbias, grasses and roses and make their gardens as sustainable as possible. Their gardens were beautifully planted but uncomfortably prickly. My favourite garden was the recently restored Jardin Secret in Marrakech, designed by the brilliant Tom Stuart-Smith. In the week I was away the garden here changed dramatically, with the daffodils, trilliums, and blossom all in full flower when I got back. The garden moves on quickly in early spring. Last week’s quite punishing frosts put paid to the flowers of Rhododendron floribundum and the just emerging leaves of Hydrangea villosa, but don’t seem to have done much other damage. 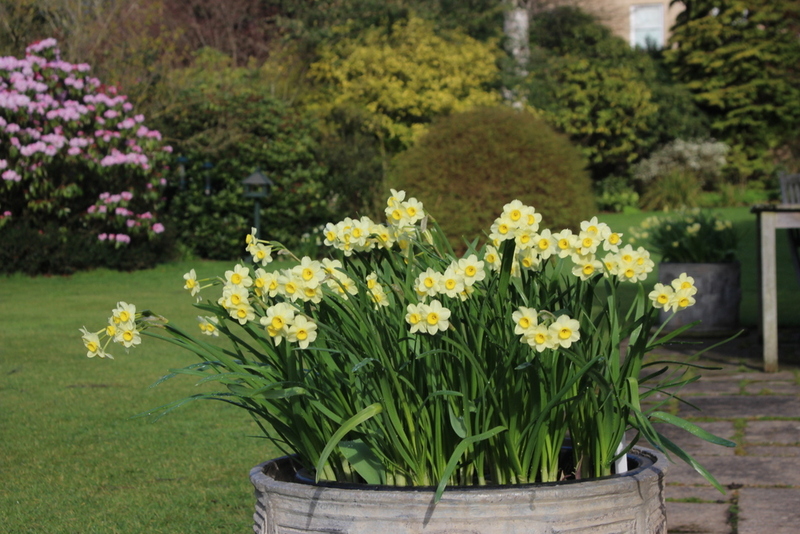 The daffodils are still in full flow, and at its peak is Narcissus ‘Minnow’. I have planted Minnow over many years, both in pots, and in with the wallflowers in our yard. It is a beautiful pale yellow, and each stem has between 2 and 4 small flowers. It is not too tall, lasts well and is very reliable. In this pot, planted in October last year, there are 30 bulbs and Minnow will be followed by Tulipa ‘Sapporo’, a similar pale yellow which fades to almost white. You can never quite rely on tulips in pots though. 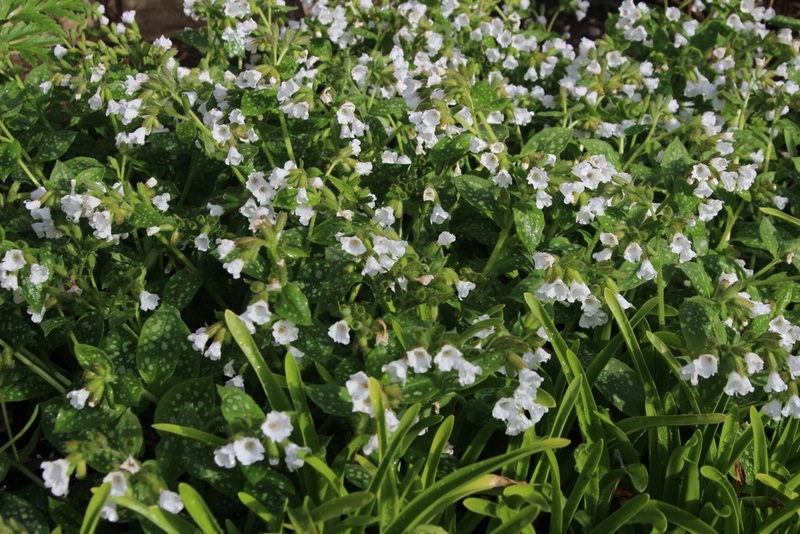 There are pulmonarias all over the garden, but my favourite is this one, P. ‘Sissinghurst White’ which is growing behind a line of nerines in full sun. It flowers early and continues for a long period with its clumps spreading and more and more flowers appearing. Some nice chance combinations occur at this time of year. 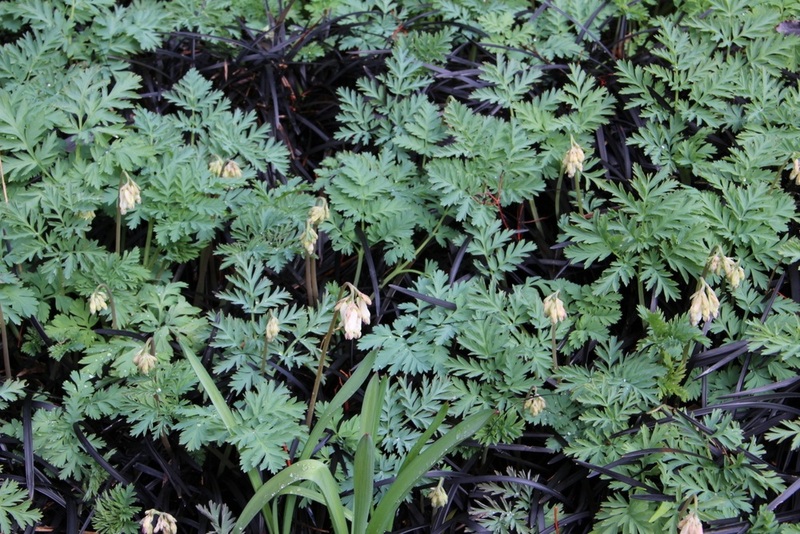 Here the grey-leaved, white Dicentra, which disappears completely later in the year, makes its own way through the black grass, Ophiopogon planiscapus ‘Nigrescens’. 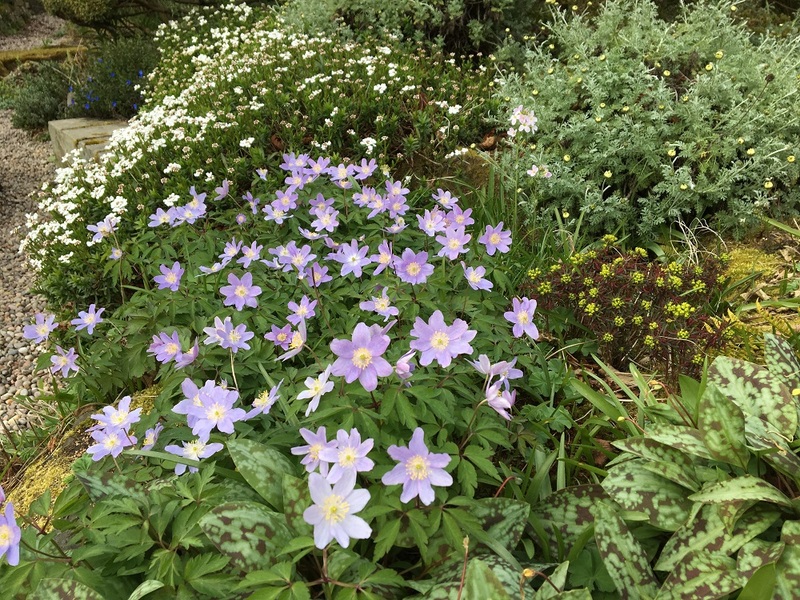 In this scene from the rockery, the pale blue anemone, which I think is Anemone nemorosa ‘Robinsoniana’ has placed itself in front of an old clump of Iberis (candytuft), with a dark form of Euphorbia cyparissias nearby. Small anemones spread well here, there are several large clumps of this pale blue one as well as a whole area of blue Anemone blanda in the gravel. And the beautiful double white one, a bit later than the others, is just coming out. We are now on count down to the garden opening on Sunday 12th May. We have added two tons of gravel to smarten the paths, the lawn is improving and most important, the new tree house is finished. We look forward to seeing Caley members and we hope that more children will come to the opening and enjoy it and perhaps a spark of interest in gardening might be kindled. Anna’s garden, Redcroft, 23 Murrayfield Road, Edinburgh EH12 6EP will be open on Sunday 12th May from 2 – 5pm, entrance £5, children free and very welcome. Proceeds to the Caley Greenhouse at Saughton fund as well as Scotland’s Garden supported charities. There should be plenty of colour in mid-May from tulips, blossom in the orchard, rhododendrons and other flowering shrubs. Anna hopes that children will enjoy the new tree house. 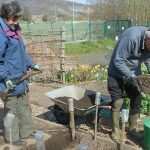 Further information from scotlandsgardens.org.